There is not enough traditional country radio these days. I realize it’s more my taste, but I love the music Randy Travis put out for so long. He always had the greatest tunes. Even the album cuts from his albums are great. To change Flashback Friday up a little bit I thought we’d take a look at a great alum track that could probably go straight to the top of the charts even today. Sometimes artists put together such a great collection of hits they don’t have room to release every song. I’m going to pretend that’s what happened with this one…The Storms Of Life . 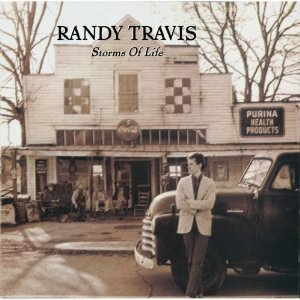 Right now in my pickup truck is the full album Storms of Life . The took out the The from the title track to make a little more appealing I think. People seem to like short phrases better so to get out the one word may have made a difference. I love the line about the cardboard box that reads Montgomery Ward. That is one of the things that makes a song special. The ability to create a lyric that isn’t cliche, but you instantly understand what this guy is living like. The Montgomery Ward customer is a certain kind of person – rural, hard working, and perhaps down on luck a bit at this moment in time. At some point in our lives we all seem to go through a stage like the narrator in this song. He’s drifting into eating fast food and slugging down beers trying to get his act together. He doesn’t really know where to go or what to do next. He just keeps rolling through life day after day looking for some direction. He made some poor decisions and it’s led him here. His better days may be behind him, but he’s going to keep rolling on until with the slim hope. What a great country song. A great country song not to be forgotten by the Country Music Life Community though.